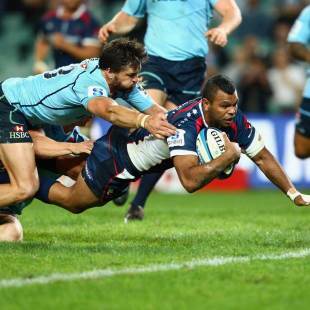 Features: Kurtley Beale to rejoin Waratahs? New South Wales coach Michael Cheika has left the door open for Kurtley Beale to return home to Sydney - but strictly on Waratahs' terms. While Cheika insisted his priority was on retaining key players, including code-hopping Israel Folau, and that he had made no contact with Beale, he said the troubled Wallabies star was an obvious talent. "There's no doubt about the guy as a player," Cheika said on Tuesday as Beale and his Melbourne teammate Cooper Vuna returned to Australia after being sent home from the Rebels' South African tour following their weekend altercation in Durban. "He's a superbly skilled player and I can see that. (But) I've never had anything to do with him. I wouldn't know what his interaction with a person like me would be, but that would only come if I met him one day and talked to him," Cheika said. "For me, it's a moot point at the moment because he's not a person I'm talking to. The main guys I'm talking to are my own players that I'm re-signing." With Beale's future with the Rebels and Wallabies in the balance, pending the outcome of separate disciplinary processes being conducted by the Rebels and the Australian Rugby Union, Cheika said it was too early to say if the 24-year-old backline ace would be back at the Tahs next season. "Obviously he's had a rough weekend so I'm not sure where that's going to fall," Cheika said. Ex-NSW and Australian teammates have made no secret of their desire to have Beale back at the Tahs. "Players are different because they're mates with him, they've hung out with him and they know him very well," Cheika said. Asked if Beale - who has a history of alcohol-related misdemeanours - would fit back in at the Waratahs, Cheika said: "I wouldn't have a clue. We've got certain values that go with our organisation that mean on-field and off-field behaviour and everyone has to apply to those values. Vuna's fate is expected to be decided within the next couple of days but, with the accusations against Beale more serious, his case will take considerably longer to complete. After making a surprise appearance at Waratahs training on Tuesday, rugby league legend Brad Fittler said Beale had the talent to make a successful code switch. "Kurtley, he is from rugby league," Fittler said. "He is a pretty good athlete. He'd be good. He is a good athlete in general. He would be good at most sports if he started it young enough."